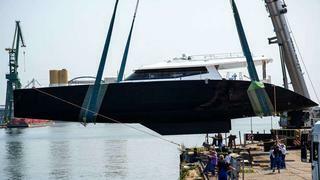 Sunreef Yachts has launched the first yacht in its 80 Carbon Line range, named Levante. The new 24.38m catamaran superyacht was commissioned for a European owner, who was recommended to the yard by the owner of the 34.7m Sunreef superyacht Che. While Levante is planned for personal use - with the owners planning to cruise from the Mediterranean to the Caribbean and then across the Pacific to the Indian Ocean - the yacht was designed with a focus on performance. Lightweight construction was utilised to help achieve the owners' performance brief that the yacht reach 20 knots in a medium breeze. She is constructed in an advanced composite sandwich combining vinylester, PVC foam and carbon/glass fibre with a carbon mas and boom and standing rigging with Kevlar. Levante weighs in at just 45T lightship and 60T fully loaded. And her sleek exterior isn't just designed to look sporty, but to reduced windage and water resistance and add to her performance. She will accommodate nine guests and four crew in a modern and minimalist interior with a white and gray colour scheme with touches of strong colours. The portside hull houses one guest stateroom and bathroom, the galley and four crew cabins while the starboard hull is home to one guest stateroom and one children's cabin - both with en suites - and the owners' dressing room and bathroom accessible from the main-deck master; this is first single-deck Sunreef catamaran that features a main-deck owners' stateroom, set forward to starboard. The Sunreef 80 Carbon Line is intended to begin a composite performance superyacht series from the Polish yacht builder. Sunreef currently reports seven projects underway in its shipyard, both power and sail, including the first Sunreef 60 LOFT.